Bank Cameroon - Commercial banks in Cameroon have increasing tried to compete and provide services to Cameroon population as do international and western banks. Of interest is their recent technology upgrade which enable almost all major banks in Cameroon to provide banking services such as online banking, ATM services (Automated Teller Machines), electronic statements and mobile money services through the use of cell/mobile phones. However, Cameroon mobile money services are less popular and less attractive compared to those of Eastern Africa nations, one of the finest mobile money systems in the world. During my recent visit to Cameroon this year, I was very impress by the exchange rates I receive (better than black-market rate) and wasn't even charged for using my non-Cameroon debit MasterCard card at various commercial banks in Cameroon. In the U.S its very difficult to fine a fee-free ATM when withdrawing from a bank other than your bank. So take advantage of Cameroon bankings services and travel light, no need to carry cash on you with all the risks involved. Just have your bank debit card and all should be fine. Things to do before taking your bank debit & Credit cards to Cameroon. Also keep in mind that Visa cards are widely accepted as compared to MasterCard. Below, I provide you with a detailed listings of commercial banks in Cameroon. This list may not be complete, so please help me if i missed something. Also, if you have a nice or nicer image of these Cameroon banks, do well to provide it for others to see. Tell us, which is your bank and how do you like it? Please share. Thank for your contribution to this article. As it stands, Cameroon banks do not charge for ATM usage, regardless of the originating bank. However, you should always check with you debit/credit card-issuer as western banks do charge for using non-issuer ATM to conduct withdraws in addition to foreign transaction fees. Tip: A smart way of having your money to Cameroon and ready to use is to open a personal Cameroon Saving accounts. You can do this in less than 1 hour, while in Cameroon. I strongly recommend using a major bank for this, e.g BICEC, Afriland Bank, Citibank, SCB, etc. The bank will hand you a printout of your account details and that will contain your bank account IBAN number. You can use this online, in person or over the phone to wire your money to Cameroon anytime. Remember that it will take two to three weeks for the amount to settle into your Cameroon account. You can transfer any amount of money for one fix-fee of USD $10 to 30 depending on your bank. This will save you money from foreign transaction fees and ATM fees charged by your U.S bank. 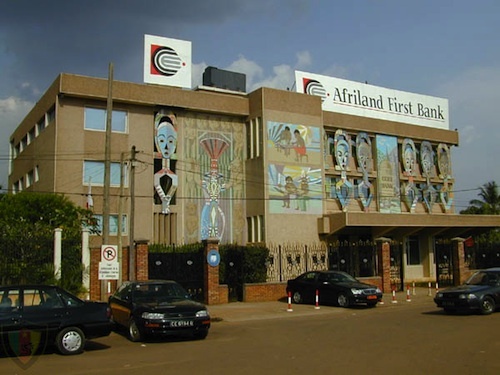 Cameroon Banks: AfriLand First Bank. AfriLand First Bank is headquartered in Yaounde, Cameroon. Founded in 1987 (then known as Caisse Commune D'Epargne et D'Investissement, i.e Loans and Savings Bank) the bank has grown into a true success story for the Cameroonian banking community. Coop. d'Epargne & Crdt des Promo.